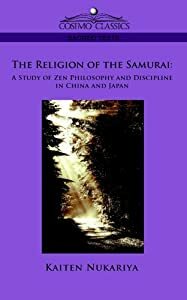 The Religion of the Samurai by Kaiten Nukariya is somewhat misnamed in that this book does not really deal with the religious beliefs or practices of Japan’s warrior class. Rather, this is a book about the Buddhist sect known as Zen that many of that class followed. There are many Buddhist sects or denominations practiced in Japan and the Zen Buddhism has had a wide following beyond the Samurai, yet somehow Zen has become especially associated with the Samurai and with Japan generally. Zen Buddhism is part of that branch of Buddhism known as the Mahayana (Great Vehicle) or Northern school, as opposed to the Theravada (Teaching of the Elders) or Southern school of Buddhism. Zen Buddhism is distinguished from other Buddhist sects by the belief in sudden, inspired enlightenment through meditation and personal instruction from a teacher. Zen Buddhist deemphasizes the study of scripture and doctrine, holding that enlightenment cannot be truly described by dead words in books. Even the instructor does not so much teach truths or beliefs as encourage the student to experience enlightenment on his own. The Religion of the Samurai is a short book, only about 160 pages in print, but it covers the subject fairly well. The book was written a century ago, but the basic facts about Zen Buddhism haven’t changed and the book does not seem to be out of date, except for a few expressions here and there. The author begins with a quick and very general survey of both major schools of Buddhism before moving to the beginnings of Zen or Ch’an in China, placing the origins within the Mahayanist context. He goes on to tell of the transmission of Zen to Japan and the sect’s influence on Japanese history and culture. The bulk of this short book is taken up with an attempt to explain the teachings of Zen. I say attempt not because the author is unsuccessful, but because by Zen’s own teachings, it is impossible to fully understand Zen without experiencing it. Still, Mr. Nukariya does an adequate job explaining Zen’s views on the nature of the universe, human nature, good and evil, and Enlightenment and its attainment. There are a few faults, though. The Kindle version of this book is not well formatted and the footnotes are interspersed in the main text. This problem may have been corrected in later versions of the ebook. 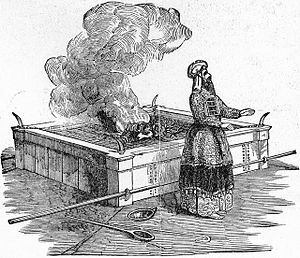 I also noticed that the author tends to disparage other Buddhist sects; especially those of the Theravada school, which he, along with many other Mahayanists refer to as Hinayana (Lesser Vehicle). This is not really a fault, but it should be noted that Mr. Nukariya was promoting Zen with this book, not providing an unbiased account. I can recommend this book to anyone wishing for an introduction to this fascinating religion. Yesterday evening I had to do the invitation at our church. An invitation is a sort of mini sermon done after the Wednesday evening Bible study. It only lasts about five or six minutes and is done by one of the men of the congregation rather than our regular preacher. In a way, I suppose it is a way to train preachers. I have actually done one once before when I substituted for somebody else. Anyway, I was asked last month if I would be willing to deliver an invitation and I, absent-mindedly said yes. Sure enough, I was schedule for May 16. I spent most of this week preparing what I wanted to say. Between that and long hours at work, I haven’t had much time or energy to write here. I was really, really nervous when I started out, but I got better as I started talking. I did stumble once or twice and if I am ever asked to speak again I will have to have my notes printed out in a larger font. I lost my place once, but it didn’t matter much since I had gone over the invitation in my head so I knew what I wanted to say. I am not sure if I did a good job. People told me I did, but this was church and they were obliged to be nice. Maybe if I made some sort of speech in a more secular environment I would get a more honest appraisal. I wouldn’t want this to be generally known, since they might ask me to do it on a semi regular basis, but despite the nervousness, I rather enjoyed myself up there. I would like to think I am making some sort of contribution. A Christian who goes out into the world without knowledge of apologetics is like a soldier going into battle unarmed. Fortunately, William Lane Craig provides the tools you need with his book On Guard: Defending Your Faith with Reason and Precision. 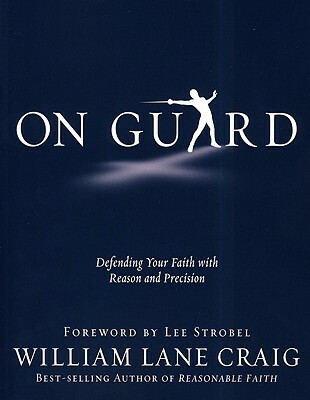 On Guard is no less than a training manual for the defender of the faith. Craig teaches the reader good reasons to believe in Christianity and how to argue these reasons convincingly. After the first two chapters, in which he introduces the subject of and necessity for apologetics, Craig uses the next section to explore reasons to believe in the existence of God. He does not specify the Christian God in this section, nor does he rely on revelation. Instead, Craig uses the Cosmological and Moral arguments, asking why anything at all exists, why is the universe so fine-tuned, where do our ideas on morality originate. I think that this section could be used by the believers of any of the monotheistic religions, Jews, Muslims, even Deists, with very little modification. Chapter seven deals with the questions of suffering and evil in the face of a good, omnipotent Deity. The final three chapters deal specifically with the Christian faith, giving evidence for the historical existence of Jesus and His resurrection. I think that this final section is slightly weaker since it seems to me that Craig did not spend enough time establishing the historical reliability of the Gospels but seemed to grant their accuracy for granted. I also think that the book could have used a chapter defining what faith is and is not. Faith is not believing in things that you have no evidence. Despite the two minor reservations I have mentioned, On Guard is a valuable resource for any Christian interested in apologetics, or who simply wants to explore why he believes what he believes.